Seaside running back Alexander Teubner is closing in on 2,000 yards rushing for the season. Gio Ramirez added 139 yards rushing on just eight carries in Friday's win. SEASIDE — Normally it takes a balanced offensive attack to win a football game. But when you have a ground game that’s unstoppable (15.9 yards every time you run the ball), why worry about a balanced attack? Hosting a first-round state playoff Friday night at Broadway Field, the Seaside Gulls picked up right where they left off in the regular season, racking up an easy 50-7 win over Cascade. Seaside had the game locked up early in the second quarter, as the Gulls ran all over the Cougars, who finish 4-5 overall. No. 3-ranked Seaside improves to 8-1, and will host sixth-ranked Estacada this week. 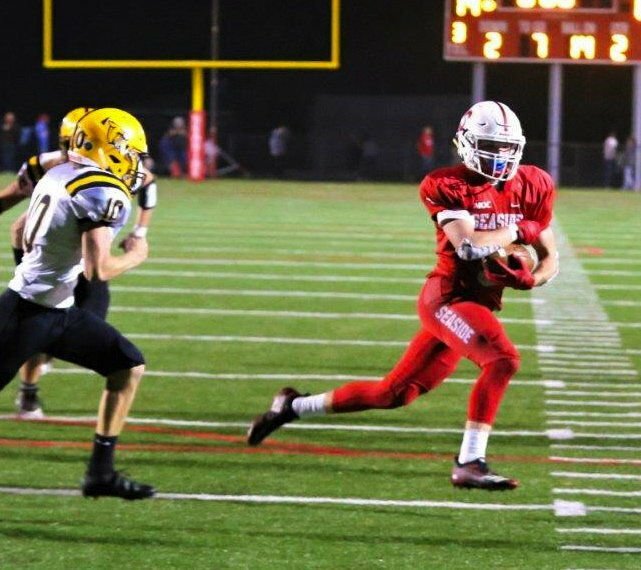 The frontrunner to win the state 4A Offensive Player of the Year award, Seaside running back Alexander Teubner rushed for 287 yards and six touchdowns on just 18 carries. Teammate Gio Ramirez ran eight times for 139 yards. Seaside rolled up 553 yards on the ground, while quarterback Payton Westerholm was 1-for-4 passing for eight yards. It took the Gulls just five plays to score their first touchdown, a 24-yard run by Teubner. Seaside had to punt on its next possession (the Gulls’ only punt of the night), but after forcing a three-and-out for the Cougars, Seaside scored three plays into the second quarter on Teubner’s 4-yard run. An interception by Seaside’s Brayden Johnson gave the Gulls the ball with under a minute remaining in the second quarter. And on the final play of the first half from the Cascade 41-yard line, the Gulls ran their version of the “Hail Mary” — a handoff to Teubner, who ran 41 yards for a touchdown as time expired. Westerholm had a 35-yard TD run in the third quarter, and Teubner capped the Seaside scoring with an 80-yard touchdown run in the fourth. Defensively, the Gulls held Cascade to 85 yards rushing on 33 carries (2.6 yards per run), while the Cougars were just 1-for-12 on third down conversions. Teubner ran his season total to 1,816 yards rushing and 35 touchdowns.